Stocks saw a very large reversal on Wednesday from being down 500 points to closing up more than 200 points. That would have been absolutely textbook if the price lows were below the lowest level of the correction which occurred on Monday or February 9th, depending on which index you look at. Technically, the price behavior has satisfied all that is needed to end the correction and begin an intermediate-term rally. However, I am not 100% convinced just yet. First, I do want to see a rally begin that’s powerful and doesn’t start and stop. Strong initiations of up legs typically do not let investors buy comfortably nor pullback early on. The first move off of a bottom is usually the strongest and straightest up. Second, we need “risk on” sectors to lead. Technology, banks, materials, discretionary, etc. We don’t want to see the defensive sectors like utilities, staples and REITs in charge. 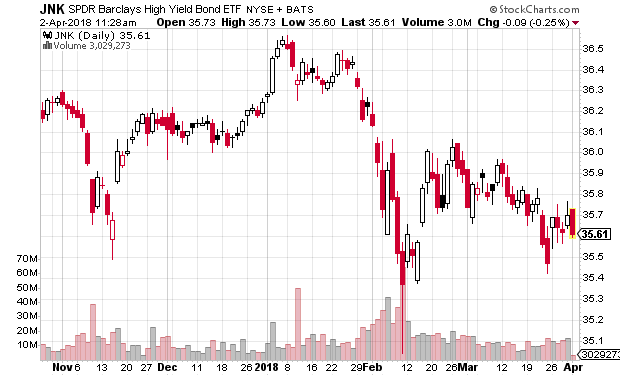 Third, high yield bonds need to step up, not just get dragged higher with everything else. And finally, we need to see broad participation in the rally. The rising tide should lift most ships early on. I usually find it instructive to listen to the pundits on TV opine at key junctures in the market. This is one of those times. If the masses believe the correction is over, it probably isn’t. If they feel like there is more downside, the bulls should be good to go. However, with The Masters on, it’s one of those rare times where personal enjoyment takes precedence. And no, I am not a Tiger fan and do not believe nor want him to win! We woke up today with more of the Trump Tariff Tantrum. 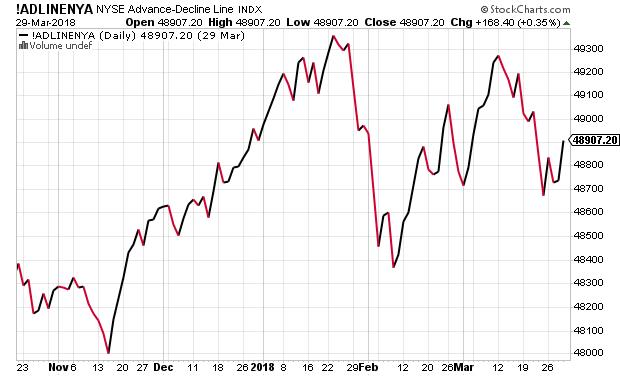 This time, China responded as everyone thought they would, but the markets reacted much worse with the Dow looking to be down 600 points at the open. I am much, much more concerned about where stocks close today rather than where they open. 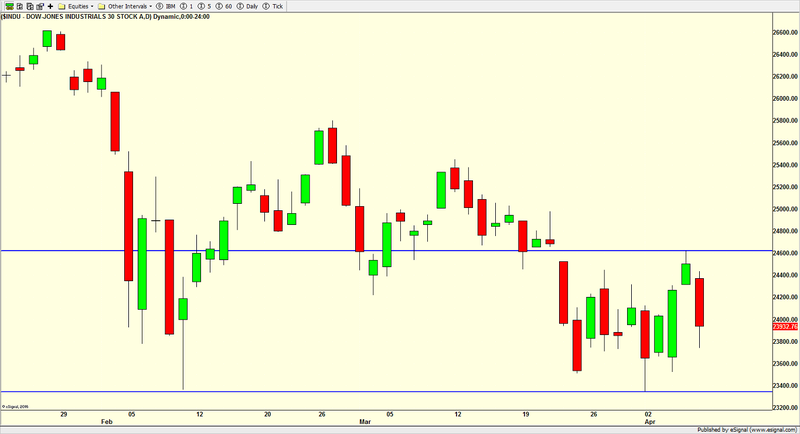 To wrap up this decline, I would either want to see a 1000 point down day or afternoon strength today. As I continue to write, tariffs and trade wars are just plain bad. I don’t care what the President tweets, no one wins. And then they spread. And prices go up. And job creation collapses. And recession ensues. However, all we have so far is jawboning. The actual tariff process takes months before it is enacted. There will likely be negotiation. For our economy’s sake, let’s hope that the adults come to the table in good faith from all sides. If they fail, those tariffs will be one strong nail in the coffin of the economy and markets. Turning to the markets, while I am still on the lookout for that elusive 1000+ point down day that takes the Dow under 23,000 to wrap up the decline, it may or may not occur. 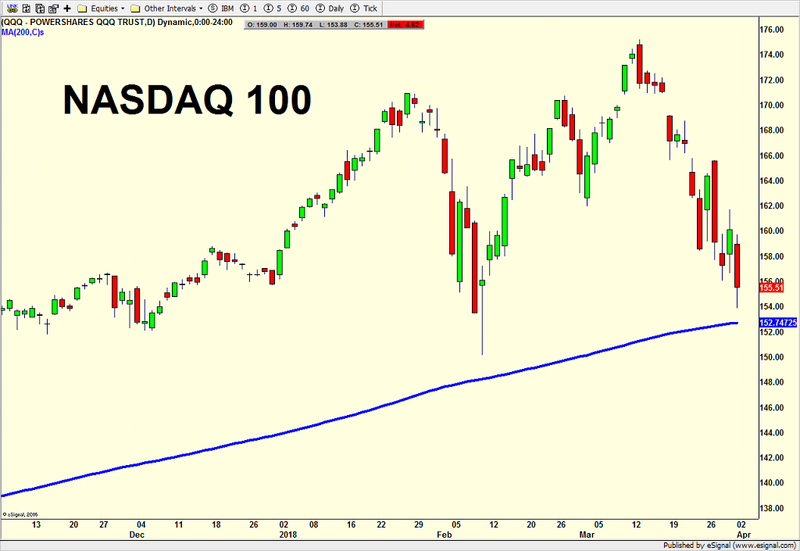 On Monday, all the talk was about the various stock market indices testing or visiting their long-term measure of trend, the 200 day moving average which is a just a fancy name for the average price of the last 200 days. 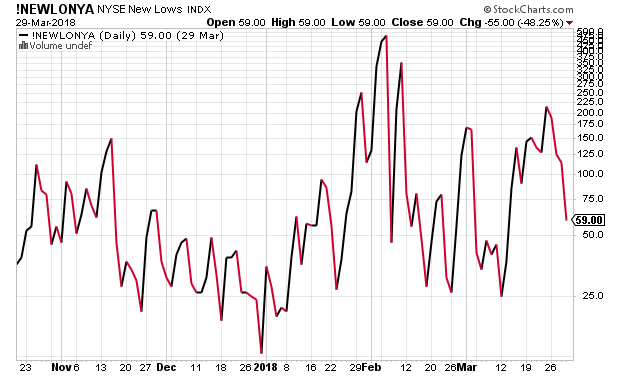 Normally, I wouldn’t give this much thought, but when non-technical people and the media talk about market technicals and moving averages, it’s worth paying attention. There is absolutely nothing magical about it or the number 200. It is very widely followed and people do make buy and sell decisions based on whether price is above or below it. Most people view the 200 day average as just a sign of trend. If prices are above it, the trend is said to be up. If prices are below it, the trend is down. In the computer based trading world, algorithms are set to flood the market with trades based on the price trading around this supposed “key” number. And these computer programs can actually force the hand of those investors who buy or sell based on this average. Anyway, I thought it would educational to run through the various indices and point out where they have touched their 200 day moving averages or long-term trends of late. 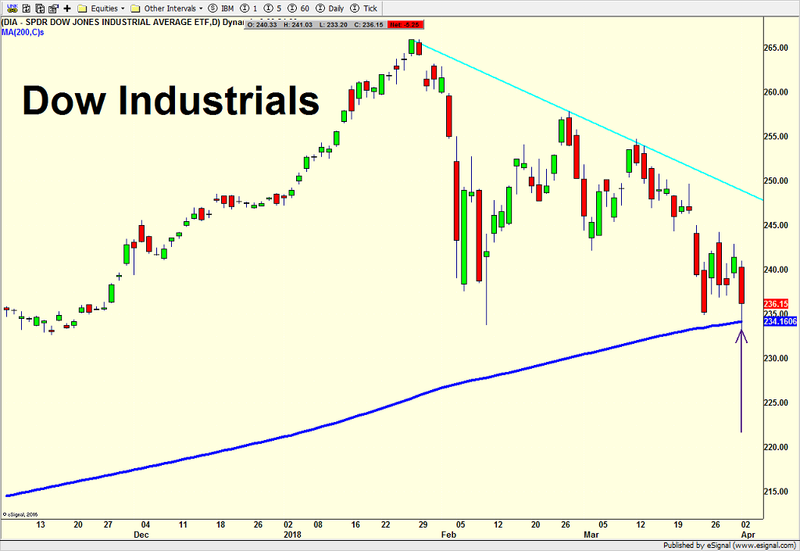 The Dow Industrials are first and you can see the purple arrow from Monday. If and when the Dow closes a day below Monday’s lowest price level, there will likely be some quick and sharp selling with the computers taking over. The S&P 500 is next and you can see three arrows where price visited its long-term trend. The one in early February, as I wrote then, seemed a bit too contrived for me and I was not convinced that the decline was over. With two more touches lately, it certainly seems like there should be a little more downside coming before the bottom is in. 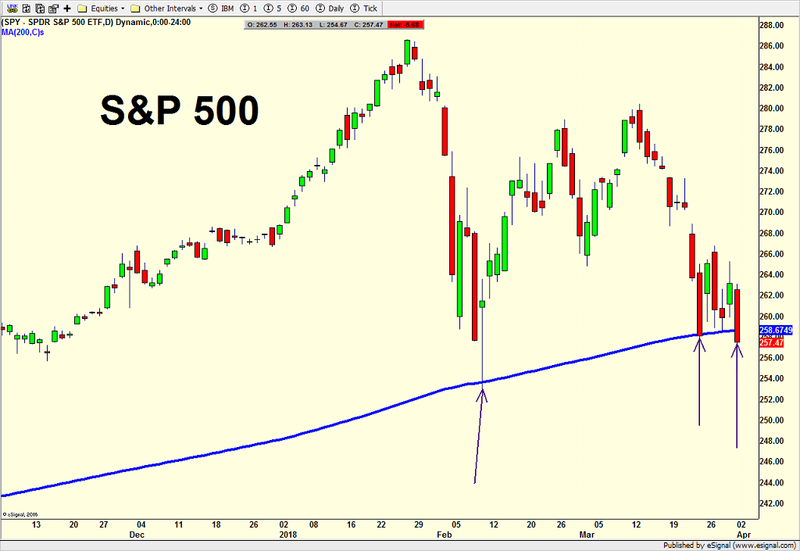 The S&P 400 is next and at the low in February you saw multiple touches of the 200 day. That was one reason why I thought this group could lead coming out of that low. 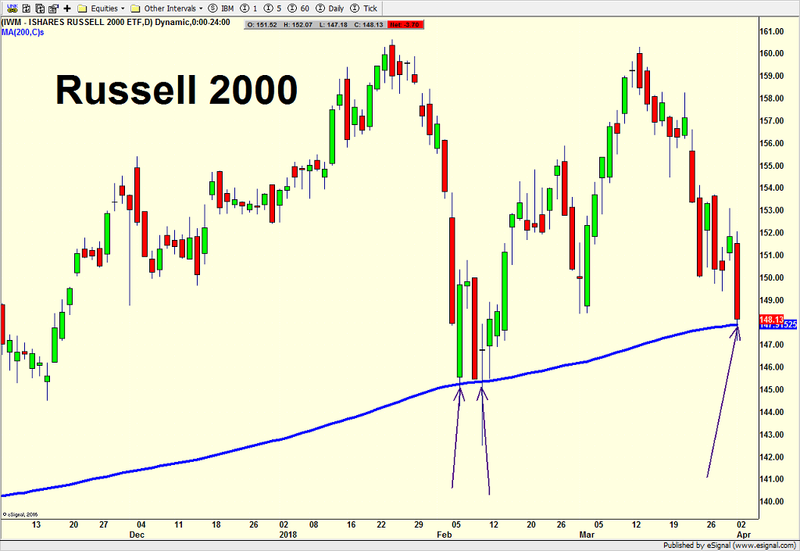 The Russell 2000 is below and it behaves similarly to the S&P 400. I thought this small cap index would lead coming out of the bottom and it performed really well into mid-March. As with the S&P 400, so far, it has remained well above the price levels seen in early February, a good sign for the intermediate-term once short-term stability returns. Finally, the NASDAQ 100 is last and to most people’s surprise, this tech-laden index has yet to test its 200 day trend although you certainly wouldn’t know it based on the commentary from the pundits and media with the Facebook controversy. It seems like every day all we hear about is the tech collapse and tech bubble being burst and the end of tech. Reality over rhetoric says that not only has the technology sector not touched its long-term trend yet, but it is also holding above the price levels seen in early February. 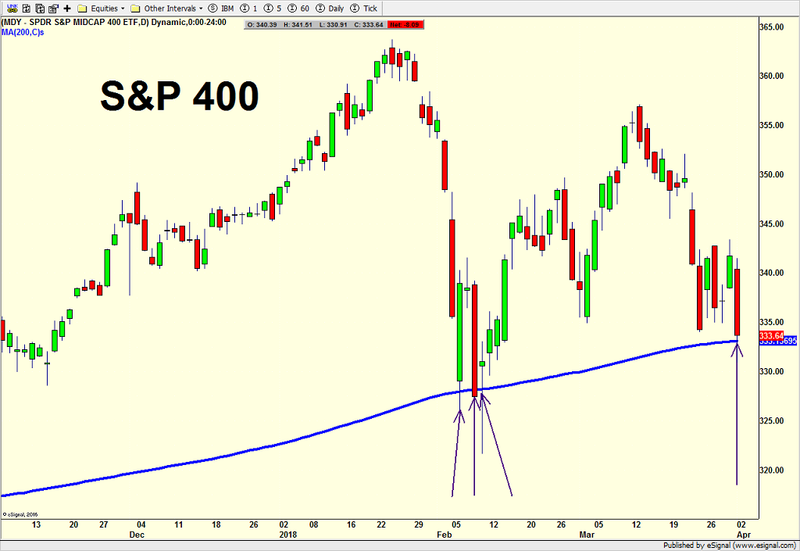 I am going to stop right here with the charts and the 200 day moving average. I think you get the picture. It’s always helpful to know where that line stands so you understand that “curious” behavior can occur around those price levels. If prices stayed below their long-term trend and the long-term trend was declining, well, that would be a bear market. The Friday before the election, our quantitative election model forecasted that Donald Trump was going to be the 45th President of the United States. I didn’t believe it myself, yet I didn’t question whether the model was broken. After all, it’s accuracy rate has been higher than 80%, correcting predicting every election since 1996. After a barrage of media interviews where some questioned whether I was just a shill for Mr. Trump, the election came and he was in fact elected President. In follow up interviews the day after the election, I offered that any pullback in stocks would be a buying opportunity for a run to all-time highs by the first quarter or so on the way to my longstanding target, first offered in 2010, of Dow 20,000. Economically, I believed that the corporate tax rate would be one of the first and easiest items to pass. I even expected a few Democrats to join the party. Tax reform would be next with the individual brackets being cut from 7 to 3 and rates for everyone making less than a million to go down. Legislation to terminate hundreds of Barack Obama’s executive orders would also be seen in the first 100 days. Infrastructure, where I have my own idea of how to pull this off without having the government borrow, would be tabled until 2018. While Donald Trump began his term with an approval rating of 42%, 66% of the people believe better times are ahead. Consumer Confidence spiked for the past two months to a 13-year high. People may seem to dislike President Trump, but they have very high expectations for the economy and their own well-being. Some could argue that’s because the GOP controls Congress and they believe Speaker Ryan will get the job done. In any case, with the stock market breaching 20,000 and at all-time highs and the economic data from Q4 still stuck in neutral, the markets and public hopes seem to be priced for perfection. That means there is not a lot of margin for error. With that in mind, it got me thinking about things that could go wrong or different paths President Trump could take. 8 – Economy sees recession during the next four years. With all of these pro-growth economic plans from Speaker Ryan, this surprise may seem counterintuitive. The past 8 years have seen the worst economic recovery of the modern era. While it may be the typical post-financial crisis expansion, it’s still underwhelming. I think Barack Obama inherited part of this, but I also think his policies caused part of it and prevented more robust growth. There is a chance that our economy has significant structural problems, like Japan on a smaller scale, and even a strong, pro-growth agenda won’t help. Additionally, presidents who follow two-term presidents typically see a recession within four years. Obama followed Bush 43 and he inherited the Great Recession. Bush 43 followed Clinton and he had the post 9-11 one. Bush 41 succeeded Reagan and he saw the S&L crisis/Gulf War oil recession. Carter followed Nixon/Ford and the economy pulled back in 1980 from Fed rate hikes. Nixon succeeded Kennedy/Johnson and he faced recession at the end of 1969 from higher inflation. JFK followed Eisenhower and he inherited a Fed-driven recession. Ike succeeded Truman and saw another inflation-led recession in 1953. Lastly, Truman took over for FDR and presided over two recessions during his first term as the economy was changing back to a peacetime economy with less government spending. 7 – Bear market in stocks by 2020. The U.S. stock market has been driving ahead since March 2009. From a low of 6500 in the Dow to 18,300 on Election Day, Barack Obama has seen one of the best stock markets of any president in history. It’s a bit ironic that the president who most railed against wealth inequality enjoyed one of the greatest booms ever and couldn’t really celebrate that. Bear markets come in two forms: with and without recession. Recessionary bear markets typically last longer and experience a larger decline. If I believe that recession is possible under Trump then so should a bear market. The next bear market will likely see a loss greater than the largest decline of the current bull market but not nearly as great as the financial crisis bear market. In that case, the next bear market should see a drop between 25% and 40% and last 6-15 months. Another surprise that seems counterintuitive since the Senate is controlled by the GOP. No president since Ronald Reagan saw all of their cabinet nominees confirmed. Every single president had at least on nominee who was rejected, John Tower in 1989 under Bush 41 or withdrawn, all of the rest since Clinton. In fact, Clinton, Bush 43 and Obama all had at least two nominees withdraw their name. While Betsy DeVos seems to be the most controversial at the moment, my sense is that a less public nominee will withdraw. It was a vicious campaign that saw allegiances move all over the place. In the end, after attacking a good number of his fellow candidates, Donald Trump reconciled in one way, shape or form with every single one of them. Given Trump’s personality and populist and nationalistic tone, there is a good chance that Paul Ryan, Mitch McConnell and the GOP end up at odds with President Trump over the details of legislation or executive orders which don’t sit well with the GOP and their constituents. As recently as 2011, Donald Trump may have been or was aligned with the Democrats. He and Senate minority leader, Chuck Schumer, used to be pals in New York City. If President Trump and the GOP have a falling out, it’s very likely that Chuck Schumer and some of the Democrats will fill that void, especially if it’s during a period where a Supreme Court Justice vacancy needs to be filled. Whether Donald Trump has a fight with the GOP or not or if the President finds common ground with the Democrats, a moderate Justice for the Supreme Court will be nominated from one of the judges whom the GOP already approved of at a lower court. All indications are that Trump’s first nomination to the bench, due in early February, will have similar views to that of Antonin Scalia whom he or she will be replacing. That will please and appease the party base. From there, it is likely that one of the liberal Justices will retire by 2020 and Trump, the consummate dealmaker, will nominate a moderate to sail through the Senate. This is probably the least surprising of all on the list. One of my theories is that Trump has been so pro-Putin because Obama and Hillary Clinton were such adversaries of Russia. It was yet another good way to differentiate during the campaign. The U.S. and Russia’s interests are so inversely aligned that it would be almost impossible for the two countries not to have a falling out by 2020. I will venture a guess that the impetus for a disagreement comes from Russia’s dealings with Iran or Syria, or Russia’s military taking aggressive positions along a bordering nation. I find it very hard to believe that Donald Trump will want to run again in 2020. While 74 is by no means old, he will have literally done it all by that time. I think there is a binary path to his party’s nomination in 2020. First, things go so well that Trump opts to leave on top, securing his legacy with the country in great shape. On the flip side, after an amazing honeymoon, his policies get bogged down first in committee and then on the floors of Congress. For the first time in his life, he is unable to make a deal. At the same time, Angela Merkel already lost the 2017 election in Germany and the euro currency and euro zone are breaking apart in 2018 and 2019. This causes major recessions in Europe and Asia that spillover into the U.S. Along with the bear market in stocks, Trump’s popularity and approval rating plummet so much that he is primaried by several in the GOP. Seeing no path to reelection, Trump withdraws from the race to retake control of his empire. There you have 8 unexpected, outside the box surprises over the next four years. Clearly, not all of them will happen, but in a vacuum, each one has a puncher’s chance. President Donald Trump is certainly going to have his hands full. After this list was published, I added two bonus shocking surprises a few days later. Donald Trump attacked and criticized the Fed and Chair Janet Yellen during the campaign. He blamed her and them for many of our economic woes along with the stock market being on the edge of a cliff about to plummet. Once 20,000 was hit, Trump changed his tune dramatically, exclaiming how great it was to achieve that milestone with more upside ahead. As Yellen’s term as chair expires at the end of 2018, Donald Trump does an about face and reappoints her for a second four year term. At that time, the Fed successfully raised interest rates to 2.5% without adversely slowing down the economy. At the same time, the stock market’s bull market kept on going with the Dow exceeding 23,000. Given how Donald Trump’s campaign went and how much turnover there was at the top, that theme continues straight to the 2018 mid-term election. At least 3 cabinet members will be replaced by then and another one or two from the rest of the inner circle. Some will be asked to leave while others will become frustrated with either the president or acrimony in Congress. Steve Bannon, Kellyanne Conway, Sean Spicer, Wilbur Ross, Steve Mnuchin, James Mattis, John Kelly, Reince Priebus are a few to keep an eye on. There has been renewed chatter lately about the U.S. economy being on the verge of recession. It’s not as loud as we (wrongly) heard in 2011, but it’s definitely growing. I vividly remember the Economic Cycle Research Institute doing interviews on CNBC, Fox Business, Bloomberg and just about every major financial website, pounding the table that there was almost 100% chance of recession in 2011 and their indicators were “never” wrong. “Never” is one of those words I don’t typically use when it comes to the markets, economy or politics. How many times did we heard that word as 2008 approached and then during the year? For the past six years, I have used the same description of our economy. That is, we are seeing the typical post financial crisis recovery. It’s uneven. Sometimes it teases and tantalizes on the upside yet frustrates on the downside. It’s anything but the “normal” recovery from recession which is usually very powerful. Deleveraging, a period of unwinding debt, usually takes 1/3 of the time it took to build up the debt. In this case, it took roughly 30 years to build so 10 years from 2008 puts us at 2018. 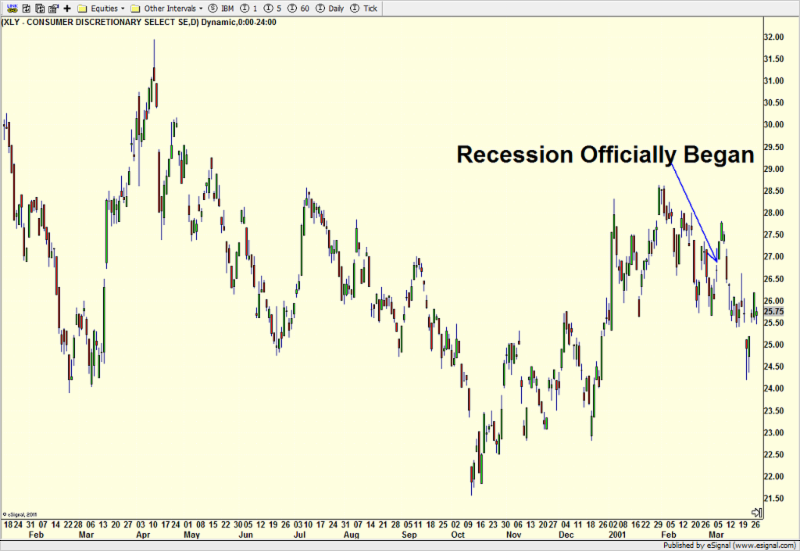 That should also coincide with a mild recession just before or during. Returning to normalcy after a financial crisis typically takes two recessions. We already survived a doozy from 2007 – 2009 and the mild recession I already mentioned should be coming this decade. I say “mild” because corporations are sitting on more than $3 trillion in cash and relatively low inventories. Of that, banks have more than $2 trillion in cash. It’s really hard to have a serious economic collapse with banks in such good shape with capital and corporations flush. Another conventional way to look for recession is to watch the activity of the consumer with their discretionary income. In good times and in bad, we all need to buy groceries, pharmaceuticals and other staples. That’s why they are referred to as defensive. However, in good times, we spend more money on cruises, Disney, resorts, jewelry, clothing, furniture, cars, dining out, etc. For the most part, those are discretionary items. Consumer discretionary is a major stock market sector and you can usually glean good information about the consumer. It’s really difficult to believe that a recession is close at hand if this sector is at or close to new highs. 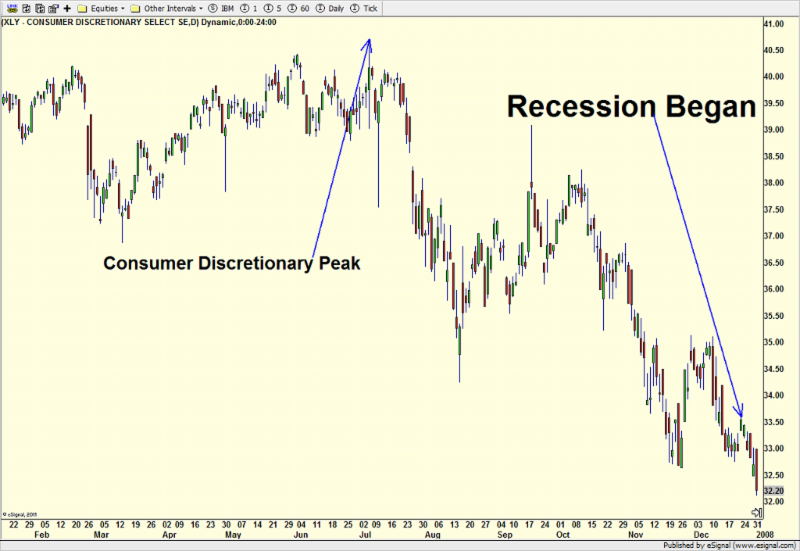 In 2011, when recession calls were abound, I looked at the chart below and saw a new high for the consumer in June. When the stock market collapsed under the weight of Greece, threat of U.S. default and the S&P downgrade of our debt, the sector went down as expected. One reason I did not see a recession coming was that it’s very unlikely that the consumer stocks peak and then recession hits within the next few months. Usually, there is much more lead time, like 6+ months, for the consumer to weaken. 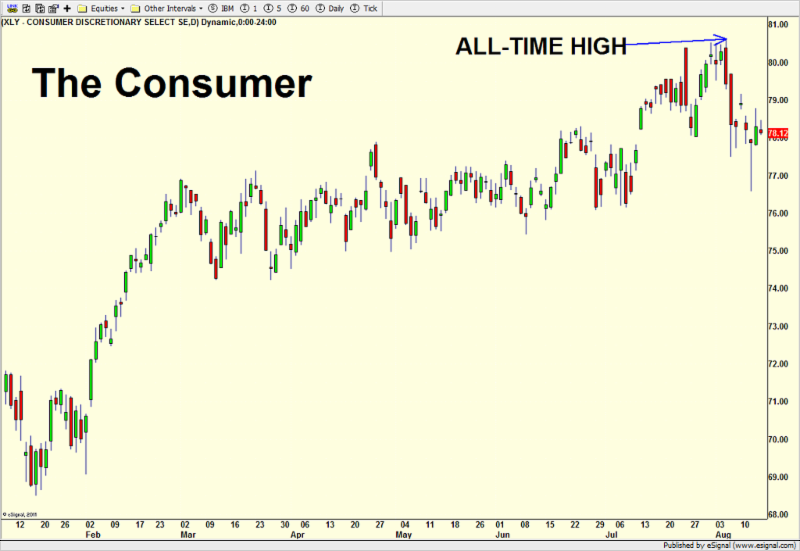 In 2001 as you can see below, the consumer sector saw its high a full year before recession hit. That recession, spurred on by the Dot Com bubble bursting and accelerated by 9-11 was brief and generally mild although the multi-year bear market in stocks was severe. Below you can see the action before the Great Recession hit. The consumer sector peaked in the middle of 2007 and then weakened dramatically to year-end when the recession officially began. I remember living this in real time and I did not believe that recession was hitting late in 2007. I saw weakening, but my original thought was that the dramatic cut in interest rates would stave off recession at that point. I was wrong. As you can see below, consumer discretionary saw an all-time high just a few short weeks ago. That makes it very difficult to believe that a recession in the U.S. is in the cards this year. I am not going to use the word “never”, but after you read the next blog, it’s really hard to argue that case.